A severely upset stomach/intestines is the number one reason for pet emergencies during the holidays! There is so much more food around, especially rich food! To help prevent an emergency, keep food buffets and snacks on tables that are too high or inaccessible for pets, and ask guests not to sneak food to small beggars (ahem). For gatherings, make sure your pet has a place to go out of the way during food prep, mealtime, and clean-up. Pancreatitis is another unfortunate food-related pet emergency during the holidays. 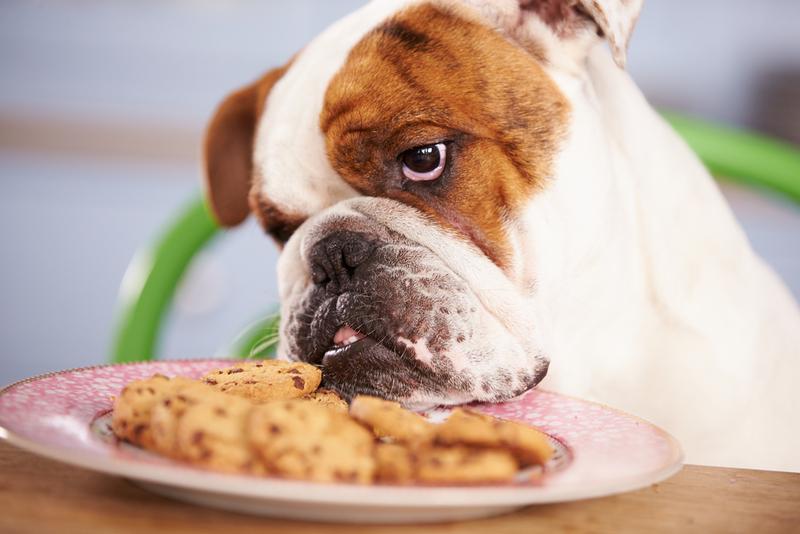 Avoid giving your pet most people food, especially rich or fatty food. It’s better to choose small quantities of healthy options, like steamed green beans or mashed sweet potato. Just as you may be annoyed with, or fight with, a family member or guest, your dog or cat may feel the same way about pet guests in your home. Wounds or bites from fights are one of the top holiday pet emergencies we see. If possible, have family board their pets (or don’t bring your pet if you’re the one traveling). Or, use separate rooms, crates, or gates to keep pets separated to avoid fights over territory, food or affection. In addition, with more people in the house, there are more opportunities for small accidents and injuries like stepping on, or tripping over, a pet. One of the beloved activities of the season is decorating. Whether that’s putting up the tree early or simply adding some baubles and sparkles to the mantel, decking the halls is a great way to get into the spirit. Unfortunately, some of those decorations can be dangerous to pets if they ingest them. Be mindful that any small ornament or decor can be ingested and become a choking hazard or foreign object lodged in your pet’s digestive tract. If your pet is prone to gobbling anything new or climbing the tree, locate your decor in a separate room that’s off limits to fur friends. Another issue around the holidays is the holiday hustle. This time of year is a whirlwind and can create a lot of stress for you. This also creates stress for your pet. Pets can get out of the home when one too many guests come through. Fireworks and loud parties can also cause noise anxiety, and therefore an increased risk of an escape. Through all of the parties and commotion, ensure that there is a quiet space for your pet to relax, and don’t forget to pay attention to them despite the chaos. An extra pat or snuggle can go a long way in reducing fear. We hope this gives you some basics in avoiding pet emergencies and increasing the holly jolly for both two-legged and four. If we can answer any questions about pet safety during the holiday season, please phone us.